The key findings of a study published today by the Transport Systems Catapult (TSC), estimates the market for Connected and Autonomous Vehicles (CAVs) in the UK at £28bn in 2035, capturing 3% of the £907bn global market. The research, carried out by Cambridge Econometrics (CE) and Element Energy, looked at the UK’s ability to capture supply chains for CAVs and CAV technologies. The study compared the potential size of the UK-based supply chain under different CAV-uptake scenarios. 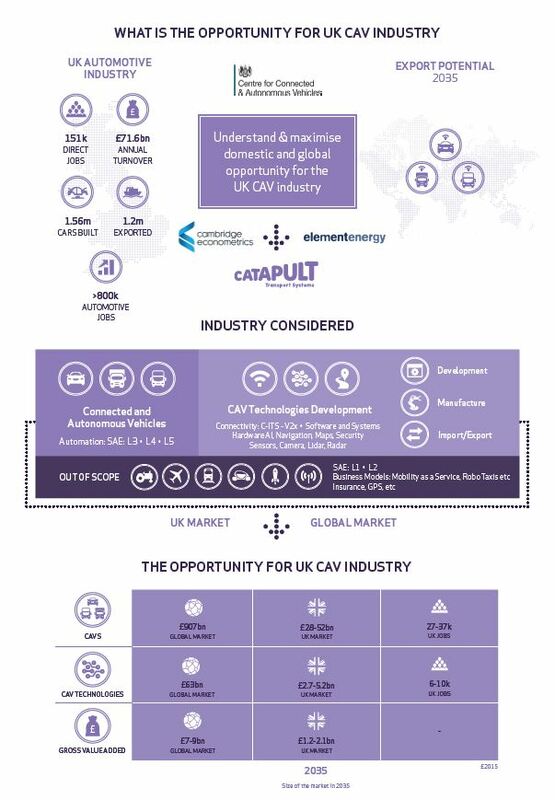 the gross direct contribution of CAVs and CAV technologies to UK GVA would reach £6.9bn and £1.2bn, respectively, by 2035.
jobs in the manufacture and assembly of CAVs would reach 6,400 people in 2020 and 27,400 by 2035.
there would be 6,000 net additional direct jobs in the production of CAV technologies in the UK by 2035, with a further 3,900 indirect jobs created in the supply chain for these technologies. What might the impact of CAVs be on the wider economy? While the focus of the TSC study is on the potential for the UK to capture the supply chains for CAVs and CAV technologies, the transition to connected and autonomous vehicles opens a number of questions about the impacts on the wider economy and the potential new business models that could emerge. CE can provide clarity on some of the challenges faced by policymakers, NGOs and the private sector as the transport sector undergoes this transformation. We have modelled the European stock of cars, HGVs and buses which, when coupled with the macroeconomic E3ME model, provides a robust tool for assessment of these types of questions.